It’s been a while since I posted to this blog! I didn’t realize there were some comments on the blog that I should address, thanks for those, and of course the book that this blog became--Grateful Dead and the Art of Rock Improvisation--has been out for a few years now, so I’ll be updating the blog description shortly too. I also have a paper the Mixolydian from the GD conference in San Jose in November of 2014 that I will be posting here shortly! Now to the night’s music: Deadhead Christian Crumlish tweeted last night on the obvious early chronology of the songs played. Indeed it is quite amazing that Truckin’ (released in November of 1970) was the newest song they played! Obviously they are shoring up their legacy in these "final" shows. Of course the danger is that they could turn into a nostalgic revelry, but perhaps that's the point...Yet there seems to be something postmodern about all this--in particular, since the death of Garcia, the band members in various configurations have been exploring and mining this early, neglected repertoire of the late 70s and onward Dead for years now. What immediately strikes me is the preponderance of E in this early repertoire. Eight out of the sixteen songs were in E. But even more significant is the interplay of E with the tonalities, modalities and notes of G, A, and D. And of course, and what I really wanted to get to, is the preponderance of the Mixolydian sound in defining the Dead and the jam band scene generally. “Cryptical” exemplifies this large-scale tonal process of E-A-G-D in a microcosm. The song is in the key of E Mixolydian, with the use of G (bIII) and D (bVII) in the chorus. As the introduction to “Other One,” the song previews the E-D Mixolydian interchange that is the jam basis for the “Other One.” Furthermore, G is a blue note in E minor pentatonic, so its chordalization (sorry for this word…) is not surprising. And use of a bIII is not unusual in 1960s’ and the Grateful Dead’s music. For the bridge (“the summer sun”), the song turns to the parallel key of E minor, with more G, and after some neat chord changes (including the use of D) winds its way to B7 (V7), providing a “classical” sounding cadence to bring back the E. But the coda has another twist, as it turns to a vamp on the chords A and G, which is itself the classic Mixolydian vamp (A as I and G as bVII). But taking a detour from the “Other One,” “Cryptical” snakes into the main “Dark Star Suite” configuration. Here the A Mixolydian jumps to prominence, and usually after the first verse the band starts to move the jam into E Dorian, which I believe they did last night. The fundamental note E links the song with the standard E>D>A progression of “St. Stephen’s.” Note this is the same progression as “Gloria,” “The Last Time,” and “Sympathy for the Devil,” among many other songs! “The Eleven” takes us back the three primary chords in A—A, D, E—and then “Love Light” is a classic R & B vamp on E and A. Following the heavy E Mixolydian statement of the “Other One,” we have another Mixolydian song, the cover “Morning Dew,” with it’s D-C (I-bVII) moments. But again, there is another cross-song tonal connection here: E (“Other One”) to D (“Morning Dew”). And if you haven’t had enough of Mixolydian yet, well, the next song, “Casey Jones,” returns to C (not heard since set one’s “Alligator”), and we get another I-bVII move, or D (“Morning Dew”) to C (“Casey Jones”). In conclusion, much has been written about the power of entrainment and the groove element of the Dead’s early dance-oriented jam music, and also their long improvisatory jams. But underlying both of these parameters are the powerful unification force of notes, keys, and modalities. It seems that much of the Dead’s Mixolydian jam sound is built up around the constellation of the notes and modes E, A, D, and G, and the slipperiness of their harmonic and tonal functioning. As one last thought, think about the use of G as a link from the E Mixolydian of “Cryptical” to the A Mixolydian of “Dark Star.” In “Cryptical” the G starts as a sharp, as the third scale degree of E. Its lowering as part of the bIII harbors the transition to “Dark Star,” where again it is so essential for defining the “Dark Star” melody and sound (the second chord of the song is often voiced as E minor). I wonder what tonight's (June 29th) set list will bring? Christian speculates that maybe they'll focus on the next era, '71-'77. After the June 28th retrospective, now that would be cool! I became friends with Garcia in 1980 and 1981 during the production and especially the editing of "Dead Ahead," the classic concert film shot at Radio City in New York. He sent me a board tape in the summer of '84, and this is when I first heard the Weir-Barlow tune "Throwing Stones." What a great and original song, and how amazing was it that a big popular band like the Dead would take on such a serious subject as the destruction of the environment. A live version of the song was included in the next full-length video I produced for the Dead, which came out in 1987 and was called "So Far." A little-known factoid: Garcia actually co-directed "So Far" with me. "So Far" went on to become the best-selling concert video of 1988 and it won the American Film Institute's award for best full-length music film of that year. Also in 1988, Grateful Dead decided to give a benefit concert at Madison Square Garden in NYC to help save the rainforest. They asked me to create visuals that would directly address rainforest destruction, to show on the live reinforcement screens hanging above the stage while they played drums/space/Throwing Stones. While prepping for that, I met Randy Hayes of Rainforest Action Network and other egg-heads and activists who would be the beneficiaries of the concert, and this is how I first learned about climate change in a serious way. It blew my mind. Members of the Dead gave a press conference at the U.N. to announce the Benefit and to talk about the trouble ahead and raise awareness of ecological issues. Ever since then, I have been very focused on the issue of climate change, and I've been able to stay involved through my work with a private family foundation that was started by my father-in-law in the 1990's. Meanwhile, I had been dreaming about making my own "story" film since I can remember--I went to NYU film school--and when I finally had the time and the means to do it, it was clear to me that my film should be about climate change. But far from being serious, the movie is darkly comic and the story is entertaining because I felt that would be the best way to get the message across. The film is called "Everything Must Go." Garcia's insightful statement at the U.N. press conference never left my mind over all those years--he was a very smart guy, on top of all his other accomplishments. Of all the problems we face, climate change is such a huge and unknowable threat that it must be seen as a priority. If the earth becomes unlivable for us humans, we certainly can't work on any of our other problems. I hope you enjoy the film, and I'd love to hear your comments. Watch this space for further journal entries in the future, and I hope to be adding new and interesting clips from my archive on a regular basis. In three parts or movements, Weather Report Suite remains one of Bob Weir’s most captivating compositions. The concepts of “suite” and “prelude” date to the Baroque, and for a rock guitarist the most well-known composer of these would have been by Bach. In fact, the “Prelude” is based on the “Bourée” from Bach’s Lute Suite no. 1 in E minor (BWV 996). Weir’s use of two-part counterpoint recalls the two-part texture of the “Bourée,” and the harmonic choices are very similar to Bach’s, with a couple of key exceptions. The three-note trills in the bass and the guitar solidify the neo-Baroque texture. The first part of Weir’s “Prelude” uses chords found in Bach’s with a slightly altered progression—E minor to Am to Bm (Bach uses B major). The second part of Weir’s begins on C major (the VI chord), and here his piece has an expansive quality lacking in Bach’s tightly wrought movement. In Bach’s case the second part sticks to the standard modulation to the III chord or G major. The counterpoint continues in Weir’s, but the real change occurs when he introduces an F chord (bII), which is not from Bach but from the world of Spanish music. Here Weir develops the idea found in the “Spanish Jam” of the Dead, which is based on Phrygian motives (half-step or in the case E-F; the Phrygian scale contains the notes E, F, G, A, B, C, D) found in Miles Davis’s 1959 album Sketches of Spain (here’s a YouTube link to a beautiful piece from the album called “Saeta”; note that the scale is transposed down to D Phrygian in this example: http://www.youtube.com/watch?v=mNx9fABz2f0&feature=related). After returning to E minor, Weir strums the G chord, with a quick C chord on the upbeat, which leads to the return of the two-part counterpoint. Here the F is resituated in a move from D major to the parallel minor which leads to a ii-V7 progression (Dm to G7) resolving to C major. Weir then ends the prelude with a surprising shift to E major through a series of V-i progressions (note that the dominant-tonic idea is found prominently in Bach’s “Bourée”), B7-Em, C#7-F#m; to get to the C#7 chord the Em becomes a E dominant seventh (with the third or G# in the bass). To bring us back to the world of 1970s rock, the E major chord (the goal) alternates with the subdominant chord (IV)or A major, which now transitions into the second movement of the WRS. Note that these two chords function as a kind of instrumental refrain in the next movement. The second movement of the WRS is referred to, confusedly, as “Part I.” Weir co-authored the lyrics with Eric Andersen (b. 1943), who was one of the performers who accompanied the Dead on the epic 1970 Festival Express train tour that made its across Canada. Click on this link (http://www.youtube.com/watch?v=g70zT3lXPZc) to see him performing “Thirsty Boots” at the Festival. A typical folk singer from the late 1960s and 1970s, Andersen’s fashions his lyrics in a sophisticated, earnest, and perhaps “sappy” poetic style. Indeed the assumed poeticism of “Part I” is unlike anything else in the Dead’s original repertoire. Weir’s progressions are more straightforward in the second movement, and contain ideas he had already developed in his recent songs from 1972, “Black Throated Wind” and “Looks Like Rain.” “Part I” turns on the relationship of E to C#m to D and F#m (chords that also figure prominently in the two songs just mentioned). The chorus of the song, which begins on the lines “And like a desert spring my lover comes and spread her wings,” modulates to D major (via a V-IV progression), and then the D-G chords essentially replicate the E-A chords mentioned above. The final part of the song is a bridge to the third movement, and begins on “Winter Gray and falling rain,” here the two oscillating chords, B-E, recall the dominant-tonic progressions of the “Prelude.” The final chord progression, played instrumentally, is A-D-C-E; the next movement, “Part II” or more commonly known as “Let it Grow,” begins on the E chord resolving to the Am7 chord. In rock history the Grateful Dead pioneered long, probing, and psychedelically oriented improvisational jams, best represented by their song “Dark Star.” However, most of these jams were not free form but actually highly organized musical structures, and followed the lines of exposition found in modal jazz of the late 1950s and 1960s, especially Miles Davis, John Coltrane (names well known to Deadheads) and their followers. Davis’s most famous modal composition is “So What” (referenced by the Dead once in 1988, click here for example), which is based on the D Dorian mode, or D-E-F-G-A-B (natural, instead of flat as it is in minor)-C. In each of the modes there is usually at least one defining note that imparts the unique sonic flavor to the mode. In the case of the Dorian it is the raised sixth note, B, producing the interval of a major sixth when heard against the tonic note, D.
The turn to modal jazz in the late 1950s by Davis, Coltrane, and Bill Evans, among others, was precipitated by George Russell’s 1953 book, Lydian Concepts. In the book he makes the theoretical case, relying on examples drawn from modern Classical music, for a modal-based improvisational practice. The result was that it freed musicians from the rigid nature of soloing over chord changes, and allowed the musicians who were comping the chords—the pianist and bassist, or guitarist—to play variant notes of the mode as an accompaniment. The end result was a melodic or linear approach to improvisation, where instead of playing the chords, the players were freed to invent new lines and melodies based on the mode. Note that the best players would deviate from the mode, as Davis did on “So What” by incorporating the C# or chromatic runs. The Dorian mode was an easy place for jazz artists to start, in that it already contained the pentatonic collection found in the blues that was also major source for jazz. Spelling it out, the collection of notes in the Dorian mode contains the notes of the minor pentatonic scale, or D-F-G-A-C. 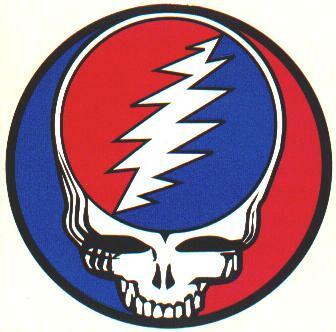 In posts to follow, I will explore some of the musical choices the Grateful Dead made in terms of modal structures. Great Dorian jams are found in: “Playing in the Band” (D), “King Solomon’s Marbles” (B), and “Eyes of the World” (B). “Eyes” is a special case because it uses modal mixture, that is, mixing the Dorian mode (B-C#-D-E-F#-G#-A) with the standard major scale (starting on E: E-F#-G#-A-B-C#-D#); note in these two scales the ½-step chromatic relationship between D and D#. In a coming post I will analyze the outro to the early “Eyes,” from 1973-1974, which featured some chord changes and musical riffs not found in 1975 and beyond. This modal mixture turning on an E reference is also found in the so-called “Mountain Jam” portion of “Alligator,” where the E minor pentatonic (E-G-A-B-D) gives way to the E major pentatonic (E-F#-G#-B-C#) quotation of the Donovan song “There is a Mountain,” which is then spiced with a D# from the E major scale (note the parallel rise in the third and the seventh: G-G#, D-D#); finally Phil’s bass line powerfully reiterates the E minor pentatonic to bring back the final chorus. In addition to the Dorian mode, the Dead often employ the Mixolydian mode (a major scale with a lowered seventh degree). For example, “Dark Star” is based on A Mixolydian (A-B-C#-D-E-F#-G) with some interesting chromatic choices. “Let it Grow,” “Wharf Rat,” “Aiko,” “Franklin’s Tower,” “Bird Song,” and “Deal” also use this mode in their jams. The Lydian mode (a major scale with a raised fourth degree), not often found in popular music, is also found in the Dead, in the song “Fire on the Mountain,” where the raised fourth degree E# is prominently heard in the main guitar riff as a lower neighbor note to the F#. Taking this idea of modal soloing a step further, I will try to show how modal linear thinking in turn also influenced the Dead’s vertical thinking, that is, the kind of chord progressions used in their music. As an obvious example, the main “Dark Star” vamp can be heard as having two chords, A and G (with the caveat that in modal jamming, the chords are not of the first order of relevance, and sometimes the chords are ambiguous or only casually present in the accompaniment—sometimes the E minor substitutes for the G). Here the G chord is built on the defining lowered seventh degree of the A Mixolydian scale. “Wharf Rat” is similar, and indeed this song seems closely related to “Dark Star.” Here the Mixolydian note “G” is the third of the E minor chord, where the main verse of the song is sung to an oscillating A chord and E minor chord. A song permeated with Mixolydian thinking is “Althea,” where the tonic is E (Bm>A>E, a minor twist on the standard blues V-IV-I, ), but the B minor (the opening chord of the song) also has the third, D, which is the Mixolydian 7th scale degree in E; finally the song’s chorus and bridge state the VII chord, or D major. Stay tuned for more modal and harmonic analysis of these and other songs. New Orleans enjoys a privileged position among American musical sites, from the birth of jazz to R &B. The Afro-Cuban based rhythms and chants of the so-called “Indians,” African Americans who dress or mask for ritualistic parades at Mardi Gras time and after, was appropriated beginning in the 1950s by the music industry, with key recordings by Professor Longhair, Dave Bartholomew, Fats Domino, Lloyd Price (who also sang a rock and roll style version of the classic bad man ballad, "Stagger Lee"), and Allen Toussaint. The Grateful Dead’s New Orleans adventures began in 1970 with a booking for two shows at the infamous Warehouse. The New Orleans’s police department was well aware of their reputation, and proceeded to procure search warrants, which led to a sensationalistic drug bust. The Dead were still able to play their show that night, and their record label was able to get them off the hook later on. They also added a show, even inviting the police, as a benefit to cover their legal costs. Dr. John informs us that this “Bo Diddley” rhythm is used as a second-line rhythm in New Orleans brass music (the main line is the main parade, the second line is comprised of the bands/audience that follow the parade). The rhythm certainly predates Bo Diddley’s use of it, and has its roots in Afro-Cuban rhythms; again, it is used in countless rock, R & B, and jazz songs. For its musical notation click here (called "Son clave"). But back to the song “New Orleans.” In the original version it begins with a solo drum introduction accompanying a vocal street cry in call-and-response form, imploring the audience for an answer. The closest the Dead get to the original, and also their most spirited version, is at Port Chester’s Capitol Theater on November 8, 1970, a fascinating show in many respects--especially the highly unique set list, the only “Mystery Train” and “My Babe” (with its “Big Railroad Blues” style guitar-riff/shuffle intro) performed by the Dead, and Jerry’s soulful delivery of “Morning Dew,” among other things. Kreutzman’s drum intro to "New Orleans" is worthy of any Mardi Gras drummer (aside: it sounds like there might be a tape splice; as a couple of bars in the beat speeds up), and Weir’s vocal energizes the band. “Aiko Aiko” (also written as “Iko Iko”) was premiered by the Dead in the middle of their now legendary East coast, Midwest, Southern tour in Spring 1977, on May 15th in St. Louis. The song would prove a staple at Dead shows, imbibing any show with the exuberant Mardi Gardi party atmosphere. The first version has a long rhythmic introduction, where Garcia simply plays the song’s lone two chords (E and B). At times tt sounds as though they are playing “Not Fade Away,” which in fact they play after “Aiko Aiko.” Yet from Garcia’s vocal in this first version of “Aiko” it is clear that the song captures the polyrhythmic drive of what the Dead’s music is about, and that the song is there to stay. Note that the key of the song would change to C (chords are C and G) the next time the Dead played it, 10/7/77 in Albuquerque, but a week later at Manor Downs in Austin, they raised it back up a step to D (chords are D and A) where it would remain for the next 18 years. D is the traditional key of “Aiko,” as played by Dr. John, the Neville Brothers, the Meters and others. And finally, the Dead introduced to their sets “Hey Pocky Way” in the late 1980s, another New Orleans song with a second-line beat from the late 1980s, probably influenced by their playing with the Neville Brothers (according to Oliver Trager in his beautifully written Grateful Dead Encyclopedia). The song also has an old lineage, with its first commercial imprint by the Meters in 1974, a regional hit in New Orleans. Brent Mydland sang it admirably, and accentuates the hook on his keyboard. The Dead begin the song with a chordal turn-around (D-C-G) that is used in the middle of the Meters version, giving the song a more definitive opening. The beauty of the New Orleans’s second-line rhythms is that it allowed the Dead to escape what could be the incessant tyranny of the standard rock, R &B (and by the late 1960s country) backbeat, and to create a show atmosphere recalling the great street parades of Mardi Gras in New Orleans. Two early cover songs from the Grateful Dead repertoire, "Hi Heeled Sneakers" and "Big Boy Pete," were recorded at a rehearsal at the The Omni on 1995-03-28; you can listen on the Internet Archive here. Unfortunately neither song would be revived in this final year. "Hi Heeled Sneakers" by Tommy Tucker (Robert Higginbotham) was last played by the Dead on 8-28-69; "Big Boy Pete" by Don and Dewey (Don Harris and Dewey Terry) but played by the Los Angeles based doo-wop group the Olympics was revived in November 1985, the video of the performance is actually up on Youtube, click here. Note that the Olympics are connected intimately to the Dead because of their song "Good Lovin'," delivered to the Dead via the Rascals. There were countless covers of "Hi Heeled Sneakers" right after it's 1964 release, but the one by the Rolling Stands out. As we can glean from this recording, the Grateful Dead would always return to their musical roots, steeped in 1950s and 1960s blues, R&B, country, and early rock and rockabilly. Yet the question that opened for me as I listened to these precious moments of a rehearsal was: why did some cover songs, like "Midnight Hour," "Dancin' in the Street," or "Not Fade Away," or "Lovelight," lend themselves to such prodigious improvisations lasting over ten minutes in many instances, while others, like "Hi Heeled Sneakers" and "Big Boy Pete," or "Walkin' the Dog," "I just want to make love to you," etc., were only given basic one or two chorus solos? I wonder if it's something in the material itself, if some songs just feel like they don't allow this opening? How conscious of a decision was it on the Dead's part to either: 1) open up a song to a massive improvisational exploration or 2) keep the song in its tight, original format. And yet the improvisations that come out of "Dancin," "Midnight," etc., certainly do not seem necessary, as if they were written into the material--I think quite the contrary, as it were. We could just as easily imagine a huge section in any of these other songs. Or not? "Hi Heeled Sneakers," and "Big Boy Pete" are essentially blues structures, whereas "Midnight Hour" or "Dancin' " have some extra chord changes, however simple they may be. Much more needs to be investigated here, as it was these early jam vehicles that led to the great original jams of the 1960s, "Dark Star" especially, and in the 1970s in songs like "Eyes" or "Playin' in the Band." Willie Cobbs (b. 1932) recorded his classic and most well-known blues song "You Don't Love Me" in 1961 in Chicago. You can hear the original on Youtube by clicking here. In 1967 John Mayall and the Bluesbreakers released a faster version of it on their album A Hard Road (also available on Youtube), and the Allman Brothers released a version of the tune recorded on 27 June 1971 at the Fillmore East for the deluxe reissue of Eat a Peach, clocking in at over 17 minutes. Before both of these cover tributes to Cobbs's original, the Grateful Dead performed the tune in concert in 1966. Deadbase X gives 12-01-66 as the first concert, but since the time of that publication (1997) there have been more tapes of 1966 unearthed. Internet Archive has one from late summer 1966 (exact date unknown), where the song is part of a sequence, namely "Good Morning Little Schoolgirl>You Don't Love Me>Good morning." The similarity of the opening heads of the two songs are easily apparent, and this is perhaps why the Grateful Dead hit on putting the two songs together. Musically both songs also share a key, A, the 12-bar blues structure, and the employment of the pentatonic scale for the head and soloing. As remarked by Sgt. O'Reilly on Internet Archive, the fact that the band put these two songs together speaks to their source: the 1965 album Hoodoo Man Blues by Junior Wells (1934-98). Also on Wells's album is the song by Arthur Crudup, "Look over Yonders Wall," also recorded that year by the Paul Butterfield Blues Band, and earlier by Elmore James, later by Freddie King (who was, coincidentally, one of Jerry's favorite guitarists, more on this when we analyze King's instrumental "Hideaway"). The Dead's version is rhythmically tight and certainly beholden to Wells. Songs like this show that at this point in their young career the band could be classified as another blues revival outfit. Garcia's voice is not yet quite at the level of Pigpen's, but it is competent, assured, and soulful. They were not, however, destined to be only a blues band, as they started to branch out and really pioneer psychedelic music. The shows from 1967 and 1968 tend more toward the new songs in their early psychedelic style, yet the band could still rip out a hot version of "Smokestack Lightnin' " or "Hurts Me Too." Indeed, tributes to the blues would remain a staple in the Dead's universe, right up to the very end in 1995 with Garcia's take on Muddy Water's "Rollin' and Tumblin'." But what of the transition of "Good Morning>You Don't>Good Morning"? Is this the first time the band inserted a song in the middle of another song? This technique of song insertion would become a hallmark of their greatest psychedelic pairing, "Cryptical>Other One>Cryptical." And even more important is the idea of the song transition without break, originally symbolized on tapes and now digitally as ">." These types of seamless jams, where for at least one or two bars (sometimes more) it is impossible to determine which song is being referenced, are of course what the Grateful Dead live concert experience was about. The transition into "You Don't" is pretty flawless, and the band keeps the same tempo. Toward the end of "You Don't" (after the five minute mark, around 5:19), the Kreutzman signals that the band is going back into "Good Morning," by emphasizing a straight eighth note pulse. When they return to "Good Morning," the energy is higher which results in a faster tempo. At 1:58, the band responds to Pigpen's vocal stylizations (listen to how he breaks the line at "Let me come on...home with you") with an increase in tempo and intensity, and Garcia plays little swirling pentatonic riffs under Pigpen's vamping. Pigpen takes the line "You make me feel alright," and goes off on "feel alright" in a way reminiscent of James Brown. As Garcia said in an early interview with Ralph J. Gleason (in the Grateful Dead Reader, p. 32): "We played in a spade show, in fact like a rhythm and blues show. I think we were a shock to them, because the music we were playing was heavy blues, certainly heavier than any of the spade guys were doing." I love this quotation because it encapsulates so much of the feel and energy of the early, primal Grateful dead: a heavy blues band. (As an aside, I wonder about the context of Garcia's use of the word "spade." Is it an racial slur? Or was it a beatnik's term for African Americans in mid-1960s San Francisco? If someone who has firsthand knowledge knows, please enlighten me, I would appreciate it. The purpose of The Grateful Dead World is to help me get my thoughts out for a book I'm writing called A Touch of the Blues: A Musicological guide to the Grateful Dead. I've had the basic ideas for the book since I gave a paper titled "The Psyschedelic Appropriation of the Blues" at the UMass Grateful Dead conference in November of 2007. I started this blog right before that conference but have neglected it ever since. My idea is that Deadheads, musicologists and anyone interested in the topic can interact with the material before publication.